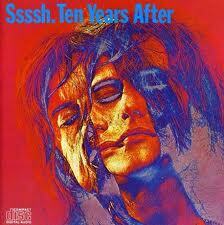 April 22 – Tuesday – Ten Years After – Ssssh. The concert we went to at the Fillmore East was the summer after Woodstock, and after the movie version had been released. Ten Years After performed the frenzied and very sweaty “I’m Going Home” on screen for all of us who couldn’t be there to be mesmerized by (you can catch it on YouTube). It seemed to go on forever, and after the song Lee hoisted a large watermelon put on stage for him, onto his shoulder and carried it off. So cool. So hot. And vice versa. But we knew of Alvin Lee and Ten Years After before Woodstock because of this album, which was one of those purchased for one song. We are so not even going to discuss “Good Morning Little Schoolgirl,” which is not the song, but could have been, I’m ashamed to say, except to mention the fabulous Leo Lyons on bass. Immediately following that song on the flip side is the much more tender “If You Should Love Me,” which is the song that prompted me to buy this album and that introduced me and my friend to this electrifying group. It was much like how the song “Heighty Hi” introduced me to Lee Michaels and propelled me further into my own individualized appreciation for rock ‘n roll. And as you can imagine, with my tastes in music as I edged through high school when my friends were into the Grateful Dead and Pink Floyd, I was often alone in my opinions. I do recall sometime after high school, my friend Vicki’s old high school boyfriend telling me that I had been right about David Bowie all along, to which I hmmphed as I had already moved on. But getting back to this album, I can’t even put into words just how exhilarating the song “I Woke Up This Morning” is. I just type the name of the song and the music starts exploding and reverberating inside me. This means of course that Ssssh. is on the list.